Versailles running back Jake Poling (6) cuts through the Celina defense in the Tigers season-opener Friday night at Celina. The Bulldogs won the game, 41-12. 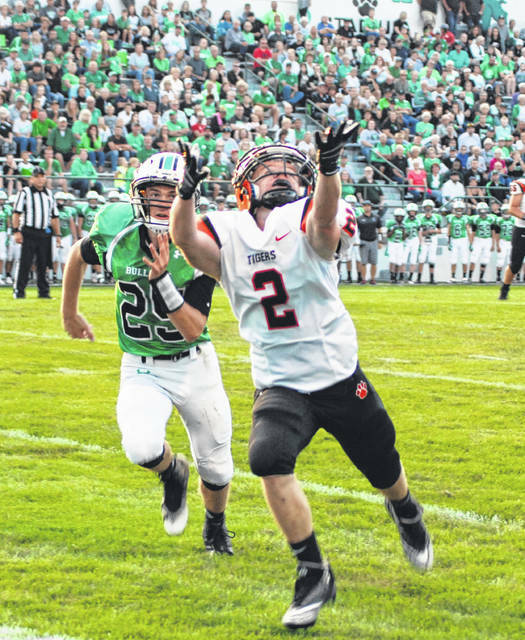 Versailles’ Adam Kremer (2) lays out for a pass during the Tigers season-opener Friday night at Celina. The Bulldogs won the game, 41-12. 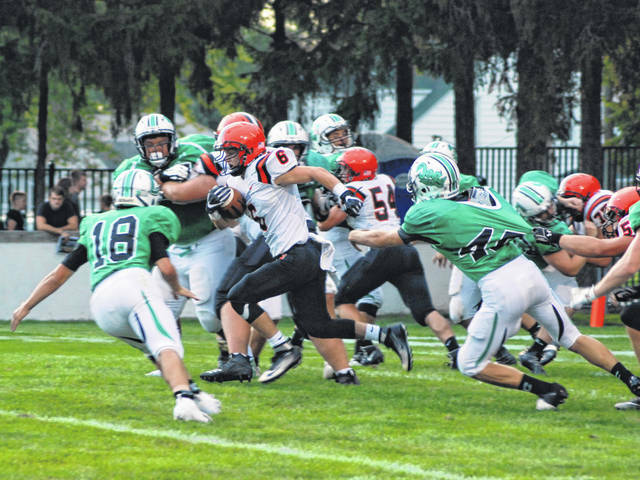 CELINA – The Versailles football team fell to 0-1 on the season with an opening night 41-12 loss to the Celina Bulldogs. The Tigers did not have an answer for the Bulldog running game, and never got moving on offense. The Bulldogs were able to break tackles and found holes to run through all night. The Bulldogs started out the night scoring on their opening possession on a 1-yard run with 7:00 minutes left in the first quarter. The Tigers had the Dogs in a third and goal at the 3-yard line and thought they recovered a fumble at the goal line, but the runner was called down. On fourth and one, the Dogs took the early lead. Celina scored again in the first after another fourth down play. The Tigers showed some life early in the second quarter when Ben Albers intercepted a pass at the Tiger 27 and returned it to the Dogs 6-yard line. Quarterback Ryan Martin scored on a 1-yard run to close the gap. The extra point was missed and the Bulldogs led 14-6. The rest of the night belonged to the Bulldogs as they scored 28 unanswered points before the Tiger second string scored a touchdown with :15 seconds left on the clock. The Tigers went for two, but were unsuccessful. Versailles will look to regroup against Delphos Jefferson next Friday night in the home opener. The Tigers lost a close 14-7 game last year. This entry was tagged Celina Bulldogs, High school football, MAC, Versailles Tigers. Bookmark the permalink.